Take a quick glimpse and you may think this dish is a summer appetizer. But the title says salad. These stuffed Roma grape tomato morsels are excellent as an appetizer and very additive thanks to their salty-sweet flavor! And I also like them as a salad for lunch! Healthy, full of summer ingredients and easy to make (I made a plateful in about 10 minutes). Of course, if you're using black olives with pits it does help to know how to pit an olive quickly. The easiest way I've found to remove an olive pit is to lay the olive on a cutting board and place a coffee mug over top of it. Apply pressure and press down until you feel the olive split. Once the olive is split it's easy to pull it apart and remove the pit. Just be sure to press away from where you're standing so you don't get sprayed with olive juice. 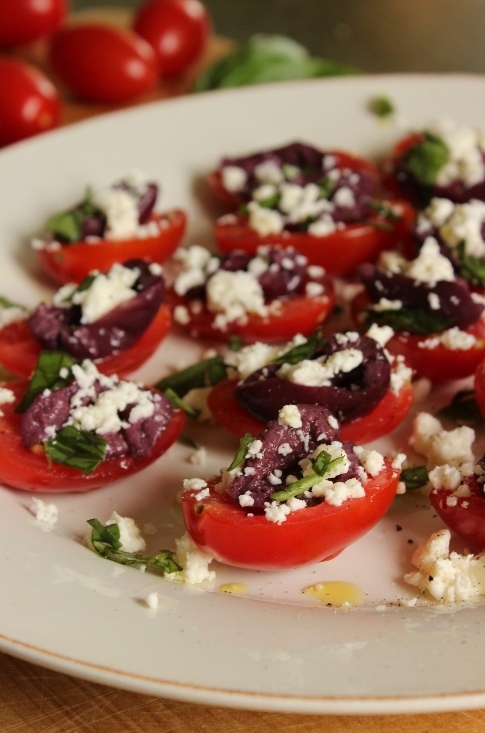 One thought I had while eating this Grape Tomato and Feta Salad for lunch was if I were to serve it as an appetizer I wouldn't get the chance to enjoy this dish. 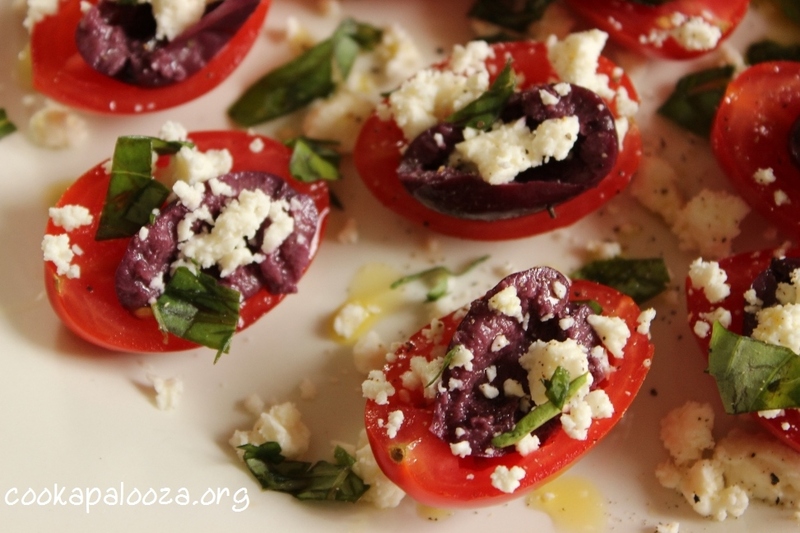 All the more reason to eat these delicious tomatoes as a salad! 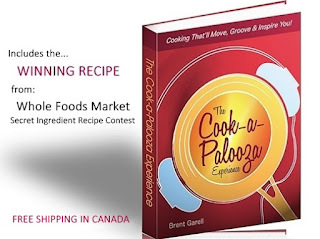 When you join the newsletter you get free access to all the salad recipes from the Cook-a-Palooza Experience Cookbook. I've been eating salads more often for lunch this summer and I'm finding that when I do, I have more energy in the afternoon! The next edition of the newsletter goes out this Sunday! 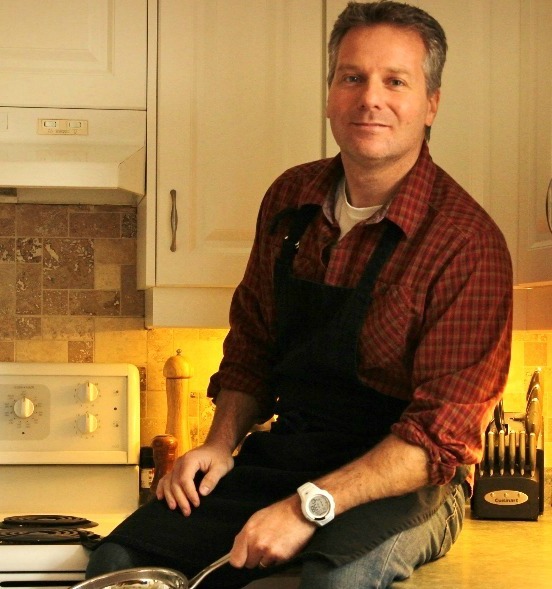 JOIN ME FOR FREE AND GET RECIPES AND FOOD IDEAS THAT GO BEYOND THE RECIPES POSTED HERE. Your privacy and email are kept safe! Delicious served as an appetizer or healthy salad. Cut tomatoes in half. Scoop out seeds into a bowl with your thumb. Place seeded tomato halves on a plate. Remove pits from olives and tear in half. Place an olive half in the middle of each tomato half. Evenly sprinkle tomatoes with feta cheese followed by chopped basil. Lightly season with salt and pepper. Drizzle with olive oil. Serve.